Large, loose, semi-double flowers which are mid-pink with darker pink veining. 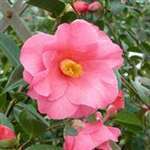 The upright, vigorous and open growth with stiff branches reflects its Camellia reticulata parentage. The mid-green leaves are strongly textured and have a matt, rather than glossy, surface. Free flowering in March and April. Very hardy. I ordered this on Sunday evening and it arrived on thursday, well wrapped up so that only a couple of buds had come off in transit. I was able to track the delivery so I knew when it was likely to arrive. I did have a problem when ordering and my order was dupicated, this was sorted very promptly after 1 email. Well done Trehane for excellent customer service! Bought for a close friend who is an expert gardener and is starting to create a new garden. She is absolutely delighted with the plant, the way it had been carefully packaged and its quality on arrival. Gift packaging was outstanding value!